Grilled asparagus adds flavor to the vegetable that you can't get indoors. The resulting asparagus makes a much more appealing side dish than the mushy asparagus that often comes from steaming the vegetable. The foil acts as a barrier to the direct heat of the grill and prevents you from losing a thin spear through the grate of the grill. Experiment with the seasonings you add to your grilled asparagus to find a combination you prefer. Wash the asparagus spears individually to remove dirt. Pat the asparagus dry with a clean towel or paper towels. Trim about 1/2 inch of the bottom of each stem to remove the dry, woody section. Spread a piece of aluminum foil large enough to allow the asparagus to fit in a single or double layer. Clumping the asparagus together makes it more difficult to cook it evenly. Pour 1 tbsp. 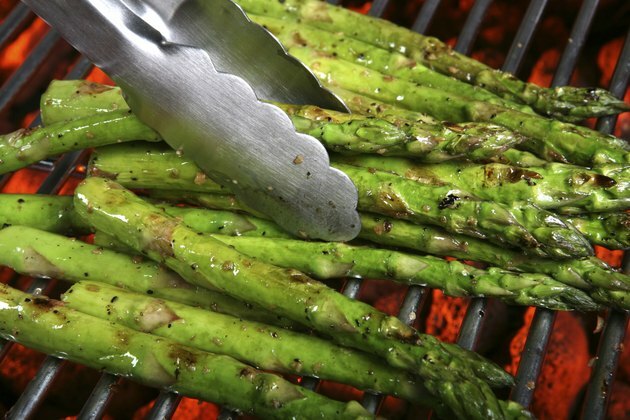 of olive or canola oil on the vegetables for every pound of asparagus you're grilling. Stir the spears around on the foil to allow the entire stems and spears to be covered lightly with the oil. Top with salt, pepper and other seasonings you want, such as garlic powder. Fold over the foil and seal the asparagus inside so the foil doesn't come open. Grill the asparagus for five to seven minutes over hot coals or medium-high heat. Turn the packet over halfway through grilling to give both sides a chance with the heat. Unwrap the foil packet and cut into an asparagus spear to see if it is done. Look for your desired texture for the vegetable. Some people prefer crisp left in the asparagus, while others like it completely soft. Cook the asparagus directly on the grill without any foil for a crispier version with more of a grilled flavor. Toss with oil and season like the foil preparation. Place the spears directly on the grate. Turn the asparagus every minute to keep it from burning and to cook evenly. Look for small brown patches to indicate that the spears are done cooking.